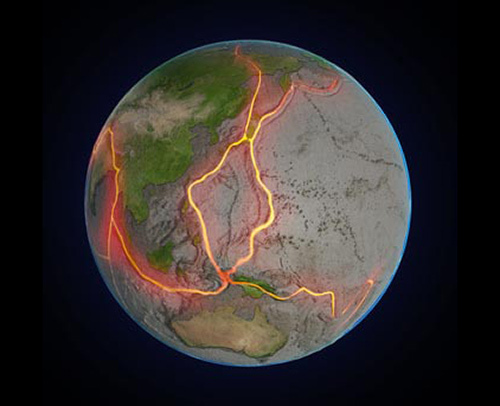 Genomics meets gene tectonics in a pancreatic cancer study that describes large-scale genomic rearrangements that can be likened to geological events. In pancreatic cancer, large slabs of DNA can slide from one genomic region to another, changing the genomic landscape. While DNA fault lines and ridges have been exposed by whole exome analysis, the broader picture is emerging only now, with the application of whole genome analysis. With the benefit of the whole genome perspective, which takes in the whole genome, not just the genome’s protein-coding sequences, four kinds of genomic rearrangement have been uncovered—“stable,” “locally rearranged,” “scattered,” and “unstable.” These four pancreatic cancer types roughly correspond to different degrees of genetic upheaval and account for the frequency, location, and types of DNA redisposition. For example, genes can be inverted, deleted, or multiplied. Also, genes can sustain damage, much like landforms can be scarred near geologic fault lines. These findings appeared February 25 in Nature, in an article entitled, “Whole genomes redefine the mutational landscape of pancreatic cancer.” Besides recognizing distinct forms of pancreatic cancer, the article emphasizes that the newly found categories could be used to improve treatments for the disease. In the case of “unstable” genomes, treatment prospects seemed especially promising. Besides pointing out four distinct pancreatic cancer subtypes, the authors noted that DNA rearrangements caused genetic chaos, with genes deleted, wrongly switched on and off, or entirely new versions created. Some of the genetic faults, however, are may be treatable with existing drugs. According to the authors, potentially druggable oncogenes include ERBB2, MET, FGFR1, CDK6, PIK3R3, and PIK3CA. The study’s authors, which included scientists from Cancer Research UK and the Garvin Institute of Medical Research, also suggested certain pancreatic cancer patients could benefit from platinum-based drugs.